When I told the parents in my kindergarten class that I would not return to teach the following year because I had been diagnosed with Parkinson’s disease, I felt compelled to let them know that there were some positive aspects of this diagnosis. 1. Now I have something to blame things on. Every time I am a little spacey, uncoordinated, forgetful, or downright weird, I can just blame it on the Parkinson’s. It’s not me. 2. Now I have something in common with Michael J. Fox. 3. No one will ever, ever expect me to run a marathon. There were other reasons, too, why I looked at this diagnosis as being very positive. For one thing, my doctor had not been sure at first that this was Parkinson’s. Leave it to me to be just a little bit different and more complicated. I try hard. I went through several neurological evaluations and the doctor talked with me about a number of possibilities, including Huntington’s and a strange disorder which she referred to as “Wild Frenchman from Maine Syndrome”. I almost wished I would be diagnosed with that last one. I think I would have had a different reaction when I told my family and friends. Tell others that you have Parkinson’s and the response is usually the same. “Oh, I’m so sorry.” This comes with a pat on the arm and a sad smile. Not that I minded, it’s just that I didn’t really know what to do with that. But just think of what would have happened if I'd told my family and friends that I was diagnosed with “Wild Frenchman from Maine Syndrome”. They'd be too busy laughing to feel sorry for me. That I could handle. The possibility of Huntington’s was not something I wanted to contemplate. When the doctor finally told me that she was 95% sure that I had idiopathic Parkinson’s disease, she had a big smile on her face and said, “Let’s hope it’s that!” We practically danced out of the room. The reason that the doctor was so thrilled was because Parkinson’s is the most treatable of the neuromuscular disorders. The medications are impressive in how quickly they can make you feel like a normal person. And now, many researchers are saying that exercise can be one of the best treatments for Parkinson's, perhaps even better and more effective than medications and even surgery for keeping you moving. Walking, biking, dancing, and yes, even running marathons are considered to be GOOD for you. Provided, of course, that you actually do it. I was involved in an exercise study for 16 months. During this time, I rode my exercise bicycle for 30 to 40 minutes every day. I was stretching and even did some exercises with weights. And I recorded every exercise session. Once a month, along with the other members of our group, I met with the physical therapist who made sure we sticking to the program. We had to show our exercise logs to the therapist. I did well! Then the study was suddenly over. It’s been about six months now since it ended and I have not exercised regularly since then. When I recently had to check in with the rehab doctor, I was gently scolded and urged to begin exercising again. Actually, when I think about it, she wasn’t really that gentle about it. She wanted to know what my barriers to exercising were. I said it was time. Life gets busy and it’s hard to have time to exercise. Make the time, she said. I had just about caved in and decided that I would have no other choice than to get on the bicycle again when something remarkable happened. A friend of mine told me about another exercise study that had taken place. This one showed, amazingly, that doing craft work, SUCH AS KNITTING, had the same health benefits as aerobic exercising! Wow. If this is the case, and I have no reason in the world to doubt this person (not to mention the fact that I have no desire to doubt her), then I can tell my doctor that I am exercising regularly. In fact, I am exercising about two hours per day! Now, I know there will be a few people who will just have to go on the internet to see if this is really true. If you find out, let me know. However, even if there are those who refute this information, I’m sure it’s just a matter of needing more research. For this, I’d be happy to be a guinea pig. I’ve got plenty of knitting to do. I blew it already. I had such high hopes of keeping this year’s resolution ALL year, without slipping. These resolutions are important. We really should be good role models for our children, shouldn’t we? And, of course, I foolishly thought that this would be an easy resolution to keep. I am finding that the art and skill of dawdling is taking a lot more attention than I had imagined. Sadly to say, I found myself multi-tasking yesterday. I was riding my exercise bicycle, watching a movie, and knitting at the same time. Lounging in the dentist’s chair later in the day, I also had my knitting on my lap and managed to get about 10 rows done while the dentist did whatever he was doing in my mouth. When it came time to make dinner in the evening, there I was, making out my to-do list for the next day, scheduling an appointment over the phone, stirring the rice, adding broth to the chicken, and, naturally, I had my knitting on my lap, too. My mind was racing. What will I donate to our school auction? How on earth am I going to get all my sewing done on time? Did I just put cinnamon on the chicken? What I can’t figure out, is why some people seem to think that multi-tasking is a good thing. They even brag about their ability to multi-task as though this is the absolute proof of their superior intelligence. Who even invented that word? What does is really mean? I suspect that it means something like, “doing many things badly at the same time.” Moms everywhere, and dads, have a great deal of experience in doing many things at once, though not by choice. Some of us even become relatively good at it. I remember the days when my children were young and I would be holding a baby in one arm, nursing, and buttering toast with the other hand, all the while I was watching my toddler and trying to discourage him from climbing into the dishwasher. I could do almost anything one handed, even break eggs. Sure, I had to pull all the little bits of shell out afterwards, but hey, I could do it! I also remember the day when I was so proud of everything I had accomplished. Two little ones, clean and fed and playing happily on the kitchen floor while I worked to clean up the kitchen and prepare dinner. I busily went back and forth between stirring the sauce on the stove, wiping down the counters, cutting up vegetables for a salad, and singing along with the latest children’s music playing on our old stereo. It was the perfect picture of domestic life. Then the phone rang and someone knocked on the door at the same time. I quickly answered the phone and asked the person on the other end to hold on a moment. I answered the door to a neighbor wanting to borrow a couple of eggs. I invited her in and picked up the phone again, stirring the sauce slightly and turning on the oven to heat it up. I had just turned down the opportunity to have a family portrait taken and receive a free 8 x 10 glossy photo, when my neighbor yelped and grabbed my sleeve. Smoke was pouring out from underneath the stove and little flames were beginning to appear. What the.....???? I dropped the phone and opened the broiler drawer that was underneath the stove and found that my son had decided that this drawer made a perfect bed for his stuffed bear. As soon as I had turned on the oven, we had fried bear. Fortunately, there was just a tiny corner of the bear that was actually flaming and I was able to pick it up with tongs and put it in the sink, turn on the water, and douse the flames quickly. By then, I could smell the sauce burning, the kids had managed to knock over the cutting board, and the vegetables were scattered on the floor. I could hear someone on the phone loudly shouting HELLO?! 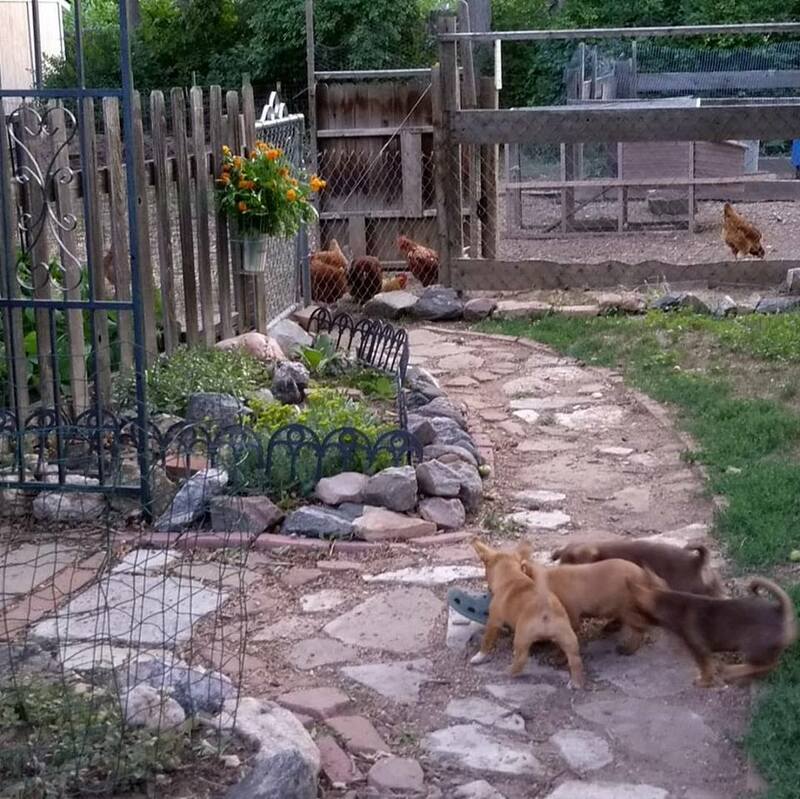 My neighbor had taken her eggs and run. I briefly considered returning the bear to the broiler and serving it for dinner. I looked forward to the day when the kids would be old enough that I could go back to work. My goal was to have a job that didn’t require doing more than one thing at a time. So, what did I do? I taught kindergarten. But at the very least, I did have a 45 minute break every day. Now that I am retired, I am determined to take life more slowly. A couple of years ago, my oldest son gave me a wonderful book, titled, In Praise of Slowness, Challenging the Cult of Speed, by Carl Honore, which describes the origins, intent, and benefits of the “slow movement”. It talks about how our culture has become dependent on clocks, how we schedule our lives and try to fit in as much as possible. Even our children’s play time is scheduled into “play dates” and we hurry to get them from play to music lessons to school to dinner to bed. It also tells how we can change this attitude towards life and time. I like the idea of a slow movement. What could be better? In the spirit of the book, I began reading, and two years later, I’m still on chapter two. One of my favorite bits in the book, so far, is when the author talks with a Buddhist teacher about these subjects of time, living by the clock, and scheduling our lives. Nearing the end of their conversation, the Buddhist teacher suddenly looks at his watch and, very sheepishly excuses himself. He had an appointment to keep and would have to hurry to get there. Like I said, dawdling takes much more attention than I realized. Going slow is an attitude change, even when life throws everything at you at once. It’s about having a balance, I suppose. I only know that if I’m not careful, I’m going to start multi-tasking again. My oldest son called a week ago with the wonderful news that he and his fiancé were married – last March! We were delighted! We adore his wife and feel that she became a part of our family from the first moment when she arrived in Denver. We weren’t particularly surprised that they were married as they had talked about this possibility with us early in March. Being married solves some logistical issues about things such as health insurance. Planning a wedding was not practical at this time either. They were both finishing their master’s theses. It’s easy to get married in Colorado now. Just fill in the form at the proper city office, show your ID and pay $10.00 for the marriage license. No Court Justice, minister, or priest is needed. A couple can “solemnize” their own marriage or have someone who is special to them be the person to solemnize their marriage. Personally, I think this is lovely! It made me think of our wedding. Chris and I were married on May 5, 1979, in a little church in Buffalo Creek, Colorado. It was a very simple wedding and everyone said it was beautiful. I’ll take their word for it. One of my favorite memories was that so much of the wedding itself ended up being wedding gifts from friends. The cake was provided by a friend who loved to bake. My sister made my dress. Another friend made banners to hang in the church. I went to purchase a wedding cross for the top of the cake and the owners of the store, who knew our family well, wrapped it up and gave it to us at no charge. Even our honeymoon was a wedding present! We stayed in a tree house in Deer Creek Canyon that was built by our friend, Fr. Roger Mollison, the man who introduced us and, when we were engaged, laughingly told everyone that we were going to “commit” matrimony. This gift was a mixed blessing, however, as it snowed just three days after our wedding. We also wrote our own vows. Looking back on them now, I realize that they really weren’t all that different from the traditional vows. We included the classic “in sickness and in health, in good times and in bad”, etc. I think that was required. These are good vows, of course, but somewhat vague. I mean, what constitutes good times or bad times? What kind of sickness are we talking about? Did we realize that we were signing up for things like being thrown up on by small children at all hours of the night? And, of course, Chris didn’t know that that he was signing up to have a wife with Parkinson’s disease. I think if we had to write vows today, I’d add a few things. To be fair and protect the innocent (me), I will make these a bit more generic and add a few suggestions that I’ve received from friends. If you see any resemblance to your own story, it could be you. ~I haven't had much sleep and haven't had the chance to shower for days? ~the house is filled with children's toys, dirty laundry, and a layer of dust that could serve as insullation? ~there is wet, dyed wool hanging in the bathroom shower, making the entire house smell like wet dog and turning the bathtub a lovely shade of purple? ~the house smells like a brewery and sounds like a rumbly tummy because there is homebrew beer fermenting in the dining room? ~the keys are locked in the car and you come all the way across town to the rescue, only to find out that the car window had been open the whole time? ~quality time together means eating at the hospital cafeteria while our child is in surgery, making valentines for our child’s kindergarten class, or watching a Little League baseball game? ~I forget to take my meds and suddenly look like a marionette with an out of control puppeteer? Or can’t get out of bed without help? ~there have been car parts or bicycle parts or plumbing parts on the living room floor for the last two weeks? ~dinner is the “chef’s surprise” and should be labeled “Eat at your own risk.”? It’s probably good that the vows we make are a bit vague. I certainly wouldn’t have wanted to know too much about what would happen or could happen. The one thing that we do know is that when we make those vows, it’s not “all about me” anymore. It’s all about WE. And it’s really not about the easy times. It’s about those times when we stumble and fall. It is when we need our partner to help us up or we need to help our partner up, even when we don’t especially feel like doing it. Do we still promise to love and cherish each other at those times? Would we still make those vows, knowing now what it is that we’ve signed up for?